The Manchester Club held its monthly meeting – its 112th – on January 19th at the American Legion hall, with a good crowd of members and guests. All present enjoyed a delicious baked haddock dinner served by John Hannah and Doc Herrick Jr. The dinner was baked haddock, mashed potatoes, fresh Caesar salad, green beans and rolls with butter. Coffee and Hoodsies finished off the dinner with the kitchen crew once again doing a fabulous job. After dinner, outgoing President Chuck Filias called the meeting to order, leading all present in the salute to the flag. He then requested Se`cretary McCoy’s report and Treasurer Scott’s report read. Both were accepted as presented. McCoy mentioned the Christmas dinner, which was held last month. 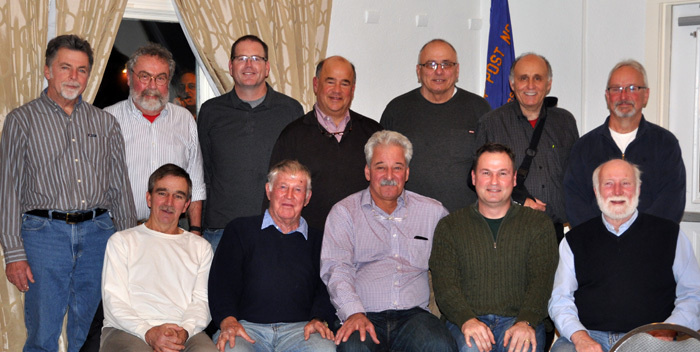 The 112th Annual meeting was then opened and the outgoing President Filias requested the yearly reports from, the Secretary and Treasurer, Both annual reports were accepted as read. The next order of business was the election off the new slate of officers for the year 2017. It was read by Sean Daly as follows; President Sean Daly, Vice President Alan Kirker, Secretary Craige McCoy, Treasurer Bill Scott and Assistant Treasurer Bob Ryan. For the Executive Board; Axel Magnuson, Bruce Heisey, Steve Stasisk and new members Scotty Cook and Eric Aldrich, for Golf Associates; Jeff Gilson, Don Lombardi, Doug Hotchkiss and Tim Brown. Chairman of the Executive Board is Chuck Filias. From the floor it was requested from past President Tim Kirby that the Secretary cast one vote for the new slate of officers. All present were in favor. President elect, Sean Daly took the gavel and made a presentation of a clock plaque to the outgoing President Chuck Filias. Filias then thanked all for their assistance during his term in office for 2016. The door prize was won by Art Secher. See you all next month.